This is an encylopedia of N scale locomotive models (restricted to North American locomotives or models factory-painted in North American livery schemes). Listed are all of the N scale locomotives that I have owned at one time or another (or locomotives that I've verified to exist but haven't acquired yet). Narrow gauge (Nn3) locomotives are not included. Locomotive shells are not included for the most part, although a few shells and kits have indeed found their way into these listings (basically the ones that seem to have some legs and aren't just a flash in the pan). Research (especially on the older locomotives) has been extensive. This has involved tracking down the very few N scale collector's guides that have been published over the years, purchasing and skimming every single issue of Model Railroader from the early 60's on, obsessively monitoring eBay auctions, scouring the internet in general, and (possibly most importantly) corresponding with many of the people actually involved in the creation of these models. Like all human endeavors, there are bound to be some mistakes in these listings, but hopefully I've kept them to a minimum. 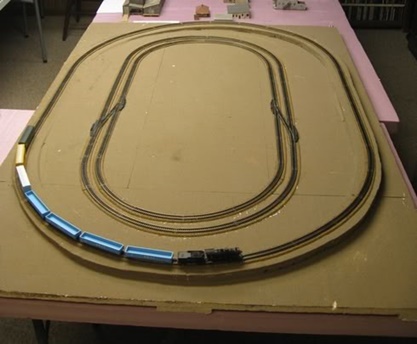 Said test layout consists of three loops of Atlas Code 80 track with 180-degree 9.75", 11" and 19" radius curves. The inner loops are interconnected with insulated frog turnouts and the outer loop encorporates a curving 2% grade. So yeah, a real torture test. Generally speaking, I will test-run a locomotive for 20-30 hours over the course of several days before writing a review.